Well, friends, here is an arresting question: what is the focus of the sophisticated world as the summer begins to draw toward its close (here in the South, of course, the end of summer is at least eight weeks away, but nevermind that)? Why — financial crisis, of course! What else could it be? Leave aside the three week pastiche of a debate on US public finances. The liberals could have succeeded in preventing that from ever happening, and still ears attuned to finance capitalism would be ringing with portents and alarums. Did you notice the drastic revision of Q1 US GDP? Ouch. Did you notice the upward revisions in virtually every official measure of the Great Recession’s damage inflicted, such that we now know that even by official statistical conjecture we have not yet regained our output and standard of living of late 2007? That’s four straight years of decline or stagnation. Or what about the horrid manufacturing numbers, which sector had for some time previous suggested the possible lineaments of a recovery? And indeed, there remains the menace and shadow of the Old World, the slow-burn of European dissolution. Their banks, their shadow banks, their funds, their sovereigns — stark and staring before them stands the shocking specter of insolvency. Central banks, meanwhile, careen toward impotence. The Federal Reserve could probably successfully connive at pulling the kind of staggering imposture some Leftists have of late recommended: coin seigniorage. But this they mean (I’m not kidding) a project to simply instruct the US Mint to mint a handful of, say, a $500,000,000,000 coins, put those suckers on deposit with the New York Fed, and walk away enough cash to balance the budget. Does that idea shock you? Well, I have another shock for you: the deflationary forces of the global economy are so severe right now that even a move as stupendous as this “seigniorage” scheme would not introduce measurable inflation. At least not immediately. Why? Because so much money is being pulled out of the active economy of finance capitalism, by frightened investors and savers, that central banks can barely keep up. Look at the poor pitiful Japanese and Swiss central banks, desperately flailing around in an effort to arrest the appreciation of their currencies, if you require a demonstration of the impotence of policymakers. Well all of this is rather striking and even stupefying. I am reminded of my strong suspicions of confident prognosticators. No one knows what in tarnation is coming next. We may be at the crisis that finally ruins America; or we may be at the crisis that finally forces repentance and rebirth. I for one, still loving and cherishing America despite her sudden penury and incapacity, pray for the latter. But the whole thing is vaguely reminiscent of Bob Dylan’s zany lyrical concoctions, ineffably American tales of capricious madness and irrepressibly erratic squalor. The fall of this plutocracy will be many things, but boring is not one of them. Coin seigniorage, huh? And yet people think I'm crazy for suggesting that we have a problem in that our currency policy seems to be based on the lie that something comes from nothing. Yes, okay, fine. I won't push it. It's the area in which I'm "crazy." But if I'm crazy, that idea is even crazier. Okay, Lydia. Let's set aside the hardest disagreement and just posit a commodity currency, based on precious metals. May I ask how that new political economy aborning would handle, say, gold derivatives? If I purchase a futures contract on gold, am I a holder of gold or must I take personal delivery to hold gold? How much collateral on overnight repo agreements must be posted in gold? What about a much more complicated derivative? What about a gold index sight-unseen short-sale of gold? Does the trader of this derivative security, too, have a claim on real gold or not? I don't think the finance capitalism problems go away because of a commodity currency reform. Another question; does your commodity currency utopia also do away with fractional reserve banking? I'm certainly on broad with a mandated increase in bank equity capital; but what the end of fractional reserves (if you take that view) entails is an extraordinarily draconian assertion of regulatory power against debt as an instrument of investment. You'd have to storm Wall Street like wild Marxists to drive out fixed-income securities as such. Well, as someone we know well says, you don't have to have a complete theory of an area complete with answers to all questions to know some things. And I'll say this: If the government can literally print two coints, declare them each (abracadabra) to be worth a trillion bucks, force them to be accepted as such, and think it can make financial woes disappear by that means, we have a problem. I would think this should be simply obvious. Talk about a concept of a free lunch! Typo: Make that "mint" two coins. Of course there are no such things as utopias, but I think that ideally there would never be any government bailouts, period. No one would believe in "too big to fail," and chickens would come home to roost. One would think that just perhaps this would produce, as by an invisible hand, some additional caution in the use of financial instruments, because people would have more to lose and couldn't count on the government to use its believed-to-be-unlimited borrowing power to bail them out. When the music plays for a much shorter time before it stops, and you might be the one left without a chair, you walk more circumspectly. The appearance of a free lunch, and the near-certainty that the crash either will come so far down the road that the reckless financier will be dead or, at least, won't affect him much because government will insulate him, encourages and enables his recklessness, and other people get hurt. Does the trader of this derivative security, too, have a claim on real gold or not? That said, I will not endorse the modern derivative markets: those are just bananas, and far removed from the fundamental principles that undergird their predecessors. Paul: May I ask how that new political economy aborning would handle, say, gold derivatives? Good questions. Read up on the new Pan Asia Gold Exchange, coming soon. We're about to find out how price discovery for physical gold might work and what role, if any, shorting and derivatives will play. (Though this development does not portend a return to commodity money, just the end of the dollar reserve standard with dollars replaced by physical gold as world's primary reserve asset). Paul: And indeed, there remains the menace and shadow of the Old World, the slow-burn of European dissolution. Their banks, their shadow banks, their funds, their sovereigns — stark and staring before them stands the shocking specter of insolvency. FOFOA: The point is that the Eurosystem's response (volume expansion) to its current systemic threat (the debt crisis) is not surprising. Does this mean the euro will collapse (experience hyperinflation)? No. Because, for one reason, it has severed the link to the nation-state. The euro is behaving perfectly predictably in maintaining the nominal performance of its system through expansion, but it cannot be forced to fund the future government profligacy of the PIIGS through volume-only expansion. That link is severed. But the dollar, on the other hand, is nominally on the hook not only for the debt mistakes of the past, but for all future dollar-denominated liabilities, obligations, entitlements and promises of the biggest debtor in all of history, on top of a debt mountain that is probably another $100T in size depending on your measurement criteria. That's a big difference. The dollar is an old currency in the winter of its life, linked to the greatest profligate debtor the world has ever known. The euro is a young currency that has severed its link to the nation-state. The ECB can save its own system, but the member states cannot force it to fund perpetual profligacy. FOFOA explains the mechanics of this further in the linked post by way of an elegant analogy with a county fair. "...despite her sudden penury and incapacity..."
Incapacity, yes - we are now close to a banana republic. Penury, not yet - we could easily borrow enough to fix up the country and end the recession - 10 year money is at 2.5% with no real expectation of inflation. We would, of course, have to be capable to actually do that. The coin idea was a way (along with the 14th Amendment) of circumventing the recent insanity with the debt ceiling. That is the only context around the notion. Given our current liquidity trap it wouldn't have been inflationary. Well, as someone we know well says, you don't have to have a complete theory of an area complete with answers to all questions to know some things. Right. I'm not asking for a full fledged theory here. I'm just trying to illustrate how "return to the gold standard" does not really answer many of my critiques of finance capitalism. Keep telling yourself that, Al. It worked so brilliantly in Japan. I'm just trying to illustrate how "return to the gold standard" does not really answer many of my critiques of finance capitalism. Just a guess, but, if it were accompanied by a hard-and-fast block on bailouts, you might be surprised. Not that there wouldn't also be a crash, but we were talking about what would or wouldn't address your "critiques of finance capitalism," which presupposes that we somehow get to a working country on the other side of this mess. Backsolve and ask yourself whether "finance capitalism" would have gotten us into this much of a mess if the people in question hadn't been able to assume or presume that they would be bailed out by the almighty government when they had overextended. Oh, also, in my so-called "utopia," government doesn't get to order people to lend to the credit-unworthy. No doubt you think that's only a small thing, but fold it in for whatever it's worth. Given our current liquidity trap it wouldn't have been inflationary. Keynesians still cling to the belief that this is all a "liquidity trap". How cute! Btw, I loved this post my Vox. If you can look at that first graph, and come away still believing that this is just a regular recession that has nothing to do with accumulated debt of the past 50+ years, and that everything will just go back to normal if the governments tosses out even more money to "stimulate" the economy by breaking the so-called "liquidity trap" and getting people to take on more debt again, then you might as well donate your brain to science while you're still alive, cause you clearly don't need it. Of course, this gives us a clear warning with regards to how The Masters of the Universe are going to try to fix the problem. Big it up and centralize it. Since the U.S. inability to pay back its foreign debt is becoming increasingly obvious, the answer will be to "look at the world as a whole", or convert a national economy into a global one in which the national debt no longer counts because "one person's liability is another person's asset". As long as the macro accounting all balances, how could there possibly be any problem? And since the European Union has shown that the stresses of monetary union cannot survive without political union to enforce austerity programs and forced transnational redistributions, this means global governance will be a necessary, indeed integral, part of the mainstream economic program. Because, after all, forcibly installing a one-world government makes so much more sense than simply replacing your inoperative and outdated economic model with one that actually works! I've asked myself that question countless times. There's no question but that the government handmaiden to finance has been absolutely vital to its rise to dominance. Continental Illinois in 1984. The integration of insured depository lenders with investment banks (i.e., deregulation). LTCM in 1998. And so on up until the mass bailouts of 2008-09. But ask yourself whether this long-term trend of socialized risk/private reward would have occurred if private industry had not shifted from deriving 10% (1950) to 40% (2005) of its profits from finance. Oh, also, in my so-called "utopia," government doesn't get to order people to lend to the credit-unworthy. But it does get to order fund managers to cease holding various classes of debt, above all the class of debt they use as the baseline in all their modeling: Treasury debt. It does get to insist that every dollar asset be pegged to a gold asset. 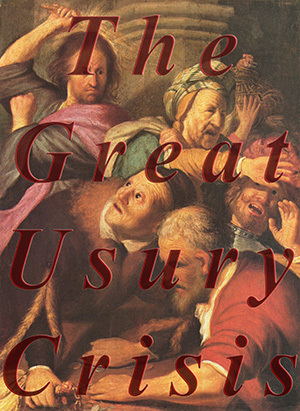 If the treasury debt is either paid off or defaulted on or goes into bankruptcy or whatever the dickens is going to happen to it, we survive that, and no more is issued, that hardly amounts to some kind of draconian imposition on the fund managers: "Thou shalt not hold Treasury debt." There just won't be any more treasury debt being issued! I can't for the life of me see how that's in any remote sense parallel to telling them to lend to the credit-unworthy. But ask yourself whether this long-term trend of socialized risk/private reward would have occurred if private industry had not shifted from deriving 10% (1950) to 40% (2005) of its profits from finance. Since the two things happened concurrently, by your own account (as I understand it), we seem to have a chicken and egg question, don't we? The above question seems to presuppose that somehow the two are independent, as though that shift "was gonna happen." That's by no means obvious. It _seems_ to me, Paul, that you just implied that for the U.S. government to get its economic house in order and *stop going further into debt* (along with backing its own currency with a commodity like gold) would be tantamount in and of itself to some kind of additional regulation against fund managers. That is such a strange way of looking at things that I can't help feeling that you and I just absolutely do not speak the same language. You have repeatedly before implied that the United States literally has a _duty_ to continue to get deeper and ever-deeper into debt because the world will stop turning if we don't (because of the need for new U.S. debt as a pricing mechanism); here, you take that one step further to imply that if the United States doesn't do so, the government is "ordering" fund managers to "cease holding" something they need. That's just...incomprehensible to me, that anyone could think that. I thought the utopia we were talking about here is one where Congress passes legislation to return us to the gold standard and a strictly balanced budget. So the parallel is that getting from A to B will require draconian measures. Now, I suppose if the dues ex machina that gets us from A to B is a massive global liquidation event, where all the world's central bankers resolve, in defiance of their statutory obligations, to cease operating as lenders of last resort and let world finance collapse: I suppose in that case it's true that a very primitive and commodity-based finance system would ensue (along with a lot of Hobbesian anarchy). By the way, I've argued all along globalization forms an important part of this story. National economies are just too limited for the ambitions of finance capitalism. Heh. I was just about to use the phrase "chicken and egg." We have to be careful not to conflate different things here. The "duty" you have in mind (I think) refers to the statutory mandate of the Federal Reserve to be the lender of last resort. That's different than the Treasury issuing risk-free paper every quarter, which all the major funds purchase and plug into their investment models. I have no problem with globalization as long as we choose a globe that no one has lived on, like the moon. That would be an excellent opportunity to try it before you buy it. Let's get that multi-national pan-global economy going on the moon. If it survives for fifty years, then maybe we are on to something. Globalization is exactly analogous to the ending solution Issac Asimov proposed in Foundation's Edge. I found it flawed because it was based on a model where the entire universe was united as a whole, almost a single mind. Asimov should have realized that making the world or universe act as an ensemble is very risky, because if one part falls, the whole falls. By far, the better way is to have a central united region with many small outlying independent regions, so that one gains the strength of the center, but the flexibility of the outsider. I have always thought that the best way to stabilize thing is not to think big, but to think small. The more independent small businesses, the better. Let the big guys deal with the slow moving aspects of government and the little guys with the fast moving aspects. The again, I'm not an economist. What I described works for nature, but man has always been a bit touched with the unnatural. That's different than the Treasury issuing risk-free paper every quarter, which all the major funds purchase and plug into their investment models. If we had a strictly balanced budget in which the deficit could not increase at all, my understanding is that you have said that such paper could no longer be issued. Is this not correct? By the way, I thought of a good analogy for bailouts and the growth of what you call "finance capitalism": Imagine that the government buys free vodka for everybody, puts up billboards for hard liquor, pushes hard liquor at the populace at every opportunity, and we have a huge upsurge of alcoholism leading to, of course, higher demand for liquor. You look at the resulting devastation and propose a return to Prohibition. I point out that the problem seems to have been (which you yourself acknowledge) in no small part the result of government's _subidizing_ hard liquor and _urging_ it on the populace. I suggest that instead of trying a return to Prohibition, we try stopping that subsidy, since things were much better before it started. Sorry for the double post. I couldn't tell whether I was the Chicken or the egg. Against whom are those draconian measures? They look to me like "draconian measures" against government itself: No new money printing. No spending more than you bring in, etc. I suppose such measures might in the end mean that the government would have to liquidate some of its own assets...(Sounds okay to me.) But when I think of "draconian" I think of issuing new, onerous, and/or harsh rules directly from some government entity against private individuals. Paul, aside from the immense political difficulty of getting the government to stop spending money they don't have (heh heh :-) just a small difficulty), if the government didn't sell any bonds next year and simply kept on paying off the bonds that are already out there in the market, the market would gradually adjust to that condition. There would be a hell of a lot of scrambling, but it could be done. If, instead, the government said that it will for the next 10 years issue 20% less in debt than the previous year, until we get down to an annual issue of (let's be simple here) 200 billion dollars, evenly spread over short, mid, and long term securities, the money managers would still have a way of buying supposedly no-risk debt. It would be a contracting supply until eventually the entire debt load of the country's government were a measly 200 billion - basically a cash line of credit for a big player. And, again, that would cause managers all sorts of adjustments, but would not plunge them into some sort of impossible situation where the government was tilting the playing field against them. That's not what would be happening. In 2001 or so, the gov stopped issuing 30-year bonds, leaving only shorter ones (as new issue). The world didn't collapse. By the way: so-called "no-risk" government securities is another brainless idea. What with Moody's and S&P cautioning that they may down-rate US debt, no-risk is a laugh. No sich animal - any country is liable to revolution if things get bad enough, and then there all bets are off - just about literally - you don't know if the currency itself will mean anything. There is no obligation for a country to be a debtor to its people so that investors have a huge no-risk pot to put money into. They can keep it in their mattresses if they don't like REAL investments like Harry's new product ideas. It isn't really investing to put it in the government's hands, when the government isn't actually using it to produce new wealth. Which, by the way, was exactly what the government and the big financial players were saying about the "consumer-driven" economic "engine" of the mid-90's to 2007, their encouragement of additional consumer credit. It's a laugh: creating new demand out of thin air by borrowing the money to spend cannot be an engine for anything but eventual collapse. It's just puffery, smoke and mirrors. I agree with Tony's comment. I believe I said in an earlier thread to Lydia that a much smaller US Treasury market could be accommodated. That would be a healthier way to operate. Yes, that is correct. This is why, incidentally, I've become exceeding interested in information relating to potential replacements in fix-income models for US Treasury debt. I suppose in my analogy, those instruments would be the vodka, but it wouldn't have been _free_ vodka (or at least perceived as free, or free to certain people) if the government hadn't given the financiers the idea that they had a "get out of jail free" pass courtesy of Uncle Sam if those risky instruments didn't work out well. I don't think, Paul, that you agree with this part of Tony's comment, because it is more radical than the latter scale-back-on-new-debt proposal. if the government didn't sell any bonds next year and simply kept on paying off the bonds that are already out there in the market, the market would gradually adjust to that condition. There would be a hell of a lot of scrambling, but it could be done. Okay, maybe there's some distance between me and Tony on that. What I doubt is that this economy would adjust. Maybe a healthy and robust world economy like the one we had when we briefly ran a surplus at the end of the Clinton term could have made the adjustments without too much disruption; but the current economic distress is still far too acute for me to embrace the risk. A smaller, more manageable federal deficit would be a better way to go, supposing the popular and congressional will were extant and sufficient to get this done. Also, Lydia, whatever the usefulness of the analogy, the vodka was never actually free. Even with the government interventions, billions upon billions upon billions in wealth was lost. These securities ruined millions of people. Ancient institutions were liquidated, high-rollers went broke, scofflaws went to prison. A smaller, more manageable federal deficit would be a better way to go, supposing the popular and congressional will were extant and sufficient to get this done. Well, anything's better than nothing, of course. As we all perceive, our government is running as fast as it can in the opposite direction. Let's put it this way: From my perspective the combination of fiat money and federal debt is like a potent, addictive, and ultimately fatal drug. Now, it may well be that the patient is in so grave a state with one thing and another (including the weakening effect of the drug itself) that the patient will die of withdrawal symptoms if made to go cold turkey. It may even (God forbid) be that the patient is so far gone that he cannot be saved no matter what. But understanding that the drug itself is deadly and is the source of the problems, including the dangers of withdrawal, is important for understanding what health is. And it may also help to guide the route to recovery, if any recovery is possible. Certainly understanding that truth about how the patient got where he is will put the doctor in a better position to help the patient than he will be if he thinks that withdrawal is the only thing to fear and that the drug itself is harmless. Also, Lydia, whatever the usefulness of the analogy, the vodka was never actually free. Of course not. Nothing is free. Encouraging the perception that it is free, or free to you, however, is a powerful incentive. We could start by seeing what is done if we remove that incentive to go hog wild with it. I suppose some people can drink vodka in moderation and come to no harm. But understanding that the drug itself is deadly and is the source of the problems, including the dangers of withdrawal, is important for understanding what health is. Where there you go. The heart of our disagreement: I do not think that "fiat money and federal debt," as such, constitute "a potent, addictive, and ultimately fatal drug," and therefore cannot endorse policies emanating from that judgment. I think both fiat money and fiscal deficits are tools that can be (and have been, in the past) employed wisely and purposed toward the prosperity and liberty of the nation. I think that these tools have been gravely misused in recent times, but that it has been private enterprise as much as government policy that has misused them. "we have not yet regained our output and standard of living of late 2007?" "We may be at the crisis that finally ruins America"
So there is not much ruin left in a modern nation, even as rich as America. It is either hysteria or it betokens such instability in a modern capitalism that would have staggered Adam Smith. Perhaps Marx was right after all about the contradictions of capitalism. Either rapid and unceasing growth or ruin? Paul, I agree that fiscal deficits are a tool, and can be used in some circumstances. They are not evil as such. But I wonder if they can easily and readily be used without causing immediate and degenerative addiction, in Lydia's metaphor. That is, it may be possible that no governmental agency is capable of starting down that road without severe danger. In truly unusual crises, like when you are in a war of national eradication, other dangers might exceed the dangers in fiscal deficits, and the tool is justified. But in ordinary and regular times, clinging to fiscal deficits in order to "run" the economy just sounds weird, to my ears. It sounds like using lightning to light a cigarette. Ordinarily choosing to go into debt for daily living expenses for a household is a TERRIBLE idea, and it is hardly likely to be different for a government: there is no internal principle of limit on that (as we have just seen), the only limits are totally arbitrary ones introduced by whim. Which - in politics - is a bad precedent all around. Now, I will freely admit that I truly do not understand the role of the Fed. I can't seem to wrap my brain around what it is in essence, and how it operates. But that's just me. Tony, I think your analogy between what is unhealthy for an individual and unhealthy for a country shows good sense. What separates me from most of the people in the world who think about economics is precisely this--that they utterly reject that analogy and indeed think it's no big deal for things to be normal and even vital to a country which, if they were vital for a family or individual, would be a sign of grave economic sickness and past irresponsibility. That gulf is one that will probably never be crossed--between this "naive" approach to economics and the regnant one(s). How can private enterprise "misuse" acts that are the prerogative of government? Only, as far as I can see, by _taking advantage_ of what the private folks believe and/or know that government will do. Which means that, however bad it is for people thus to take advantage, the government's intention to engage in those acts provided a perverse incentive. We can't just ignore that. That's _part_ of the addictive and dangerous nature I'm talking about. Free marketers' critique of government bailouts and other interventions is all about perverse incentives. "Perhaps Marx was right after all about the contradictions of capitalism." Contradictions? What contradictions? We don't see no steenking contradictions! "What separates me from most of the people in the world who think about economics is precisely this--that they utterly reject that analogy and indeed think it's no big deal for things to be normal and even vital to a country which, if they were vital for a family or individual, would be a sign of grave economic sickness and past irresponsibility. That gulf is one that will probably never be crossed--between this 'naive' approach to economics and the regnant one(s)." Page for Mr. Berry! Mr. Berry, you have a call! A case or strange bedfellows indeed. On the contrary, Berry's one of the sanest voices out there on economic issues, as he's one of the few who still attempts to understand the subject from the standpoint of the "household," which is of course what "economy" originally meant. See, for instance, the essay "Renewing Husbandry" from The Way of Ignorance or "Money Vs. Goods" from What Matters? On the other hand, St. Anthony of Egypt did say that the day would come when the mad would say that the sane were mad because "they are not like us." In my opinion, anyone who'd call W.B. insane may just want to take at least a brief glance in the looking glass. Side note for Titus: futures contracts and options on futures are not the same thing. Options, yes, are 'optional'; and while most futures contracts can be satisfied financially, some futures contracts require physical acceptance/delivery of the goods. You can roll the contracted delivery date forward, but at some point you have to find space in your fridge for your trainload of bacon. But Lydia, I think your analogy stumbles out the gate, on that crucial phrase "Imagine that the government buys free vodka for everybody." The "free vodka" in the case of finance capitalism was the series of novel and exciting inventions by private industry in the field of rocket science financial products. And let's not forget, if you read Lewis' excellent book_The Big Short_we know there were smart folks on Wall Street (and in other places around the country) who did recognize that the Emperor had no clothes and made a killing by betting on the eventual collapse. Speaking of the Euro, which no one is but it was mentioned in the title, even establishmentarian extraordinaire Matthew Yglesias is saying now that the Euro project looks like an impending failure. When I argue with liberals I constantly emphasize the governmental features of the crisis: mortgage distortions, TBTF, the enormous influence of the big public pension funds, etc. When I argue with conservatives I constantly emphasize the private enterprise feature of the crisis: shadow banking, exotic modeling methods, bond arbitrage, high-frequency trading, etc. It takes two to tango. No serious explanation of the crash of 2008 can ignore the role of government in the mortgage market; no serious explanation of the near-crash of 1998 can ignore the role of pristine private enterprise. I take my duty in all this to not let either side get away with their favored tendentious narratives. "Keynesians still cling to the belief that this is all a "liquidity trap". How cute!" or one could continue taking this Vox seriously. Also there are at least three possible trend lines in that graph. The one that started around 2000 reflects seems unsustainable. There is also a Krugman quote that also leads ones to suspect that this Vox doesn't understand what's going on. Here is a better selection with an actual link. "In the current policy debate, debt is often invoked as a reason to dismiss calls for expansionary fiscal policy as a response to unemployment; you can’t solve a problem created by debt by running up even more debt, say the critics. Households borrowed too much, say many people; now you want the government to borrow even more?" "What's wrong with that argument? It assumes, implicitly, that debt is debt – that it doesn't matter who owes the money. Yet that can't be right; if it were, debt wouldn't be a problem in the first place. After all, to a first approximation debt is money we owe to ourselves – yes, the US has debt to China etc., but that's not at the heart of the problem. Ignoring the foreign component, or looking at the world as a whole, the overall level of debt makes no difference to aggregate net worth – one person's liability is another person's asset." "It follows that the level of debt matters only because the distribution of that debt matters, because highly indebted players face different constraints from players with low debt. And this means that all debt isn't created equal – which is why borrowing by some actors now can help cure problems created by excess borrowing by other actors in the past. This becomes very clear in our analysis. In the model, deficit-financed government spending can, at least in principle, allow the economy to avoid unemployment and deflation while highly indebted private-sector agents repair their balance sheets, and the government can pay down its debts once the deleveraging crisis is past." "In short, one gains a much clearer view of the problems now facing the world, and their potential solutions, if one takes the role of debt and the constraints faced by debtors seriously. And yes, this analysis does suggest that the current conventional wisdom about what policymakers should be doing is almost completely wrong." "Keep telling yourself that, Al. It worked so brilliantly in Japan"
I assume you refer to 1995 and it it would have helped if they didn't pull a '37 in following years. Undoing with one hand the good done with the other has predictable results. This (and his book) may be of interest. "I know that the very same self-limiting discussions took place at Okurasho, the Japanese Ministry of Finance circa 1995-1998. And they ended with the same result, a series of bank-recapitalization plans that tried to mobilize private-sector monies and overpay for distressed bank assets without forcing the banks to truly write off the losses. Even though the top Japanese technocrats at the ministry were even more insulated from a weak Diet than the congressionally unconfirmed advisers currently running economic policy for the Obama administration, they did worse. Whatever the political context, countries usually try to end banking crises on the cheap, with a limited public role at first, overpaying for distressed assets and failing to change banks’ behavior, only to have to go back in a couple of years later." Come what may, the plutocrats will have their jungle gyms and sandboxes.